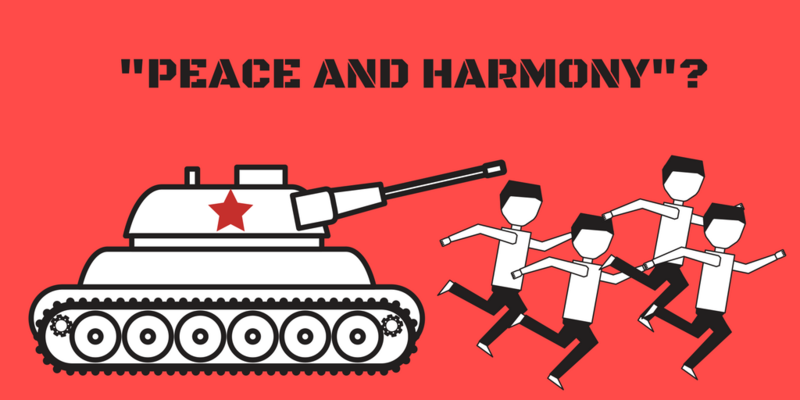 As explained in detail here, the Soviet invasion of Czechoslovakia was described in the official TV channel of Russia’s Ministry of Defence, Zvezda, as a way of preserving peace and harmony in the region. It was in fact a foreign hostile invasion. Coinciding with the official Day of Remembrance of the Victims of the Holodomor, this man-made famine in Ukraine during 1932-33 was subjected to extensive historical revisionism by Russian state controlled TV. it is not the first time that atrocities are used for disinformation purposes. In the TV show “Vremya pokazhet” it was stated that it was a lie to claim that this was a purposeful famine, directed at Ukrainians. And in another popular TV show on Russian state TV it was claimed that it was in fact an epidemic that claimed so may lives during those years in Ukraine, not an intentional policy of the Stalin era. The facts are that, in a country once referred to as Europe’s bread basket, people suddenly starved to death in masses due to lack of food, caused by a deliberate policy to punish the Ukrainian peasantry, which had continued to resist the Soviet policy of collectivization. On 23 October 2008, the European Parliament adopted a resolution that recognised the Holodomor as a crime against humanity, caused by the deliberate policies of Stalin’s USSR. And on 28 April 2010, a resolution of the Parliamentary Assembly of the Council of Europe declared the famine was caused by the “cruel and deliberate actions and policies of the Soviet regime” and was responsible for the deaths of “millions of innocent people” in Ukraine, Belarus, Kazakhstan, Moldova and Russia. 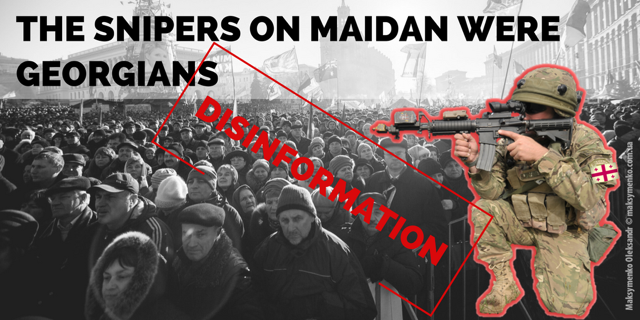 During the past week, pro-Kremlin disinformation outlets marked the fourth anniversary of the beginning of the protests at the Maidan Nezalezhnosti (Independence Square) in Kyiv, Ukraine. For at least four years, Ukraine has been a permanent front-line and testing ground for the multi-language pro-Kremlin disinformation campaign, in order to justify Russia’s military intervention and illegal annexation of Crimea. This week’s disinformation gold mine was an Italian documentary that claimed it was Georgian snipers who opened fire on protesters in February 2014. For a detailed debunk of the flaws, manipulations and inaccuracies the documentary is built on, read the analyses by Myth Detector, StopFake and the Insider. The story was covered by the main Russian TV channels and news outlets and on news portals in English and in Georgian. Let’s look at how the disinformation was tailored to these different audiences. For English language readers, the credibility of an established European media outlet was of importance. The website spreading the story starts with explaining that the “TV documentary emanates from the mainstream media” from the “most watched TV channel in Italy”. In direct contradiction to this argument, though, the next statement says that “the Western corporate media remains silent” about the issue, but “independent ” ones ensure its distribution. For the Russian audience, disinforming reports about Georgian snipers were easier to serve. The “news” about the documentary was accompanied by the usual allegations of Ukraine being governed by Nazis and denials of Russian military presence in Ukraine. Furthermore, former Georgian President Mikhail Saakashvili has been a top target for conspiracies and disinformation this autumn, so implicating him fitted the general disinformation picture. In Georgian, the disinformation mainly followed the reporting in the Russian language, Myth Detector notes. One outlet directly accused Saakashvili of the shooting. Another made the message even simpler. It quoted the Italian journalist’s Facebook post that claimed; “snipers admitted: EU-backed opposition leaders, rather than supporters of President Yanukovych, opened fire on protesters”. As usual, no evidence for the claims was provided. Additional details: Georgian sniper trio killed demonstrators on Euromaidan. The operation was initiated by the former president of Georgia Mikheil Saakashvili, Italian documentary shows. Additional details: For Western Europe, the territory to the East is an annex of resources. The Europeans will not tolerate any sovereign state or territorial entity that does not feel itself an attachment to their interests. They declare a zone of their interests - this is a normal strategy - those countries, through which the oil and gas pipelines, that are feeding and supplying Europe, pass today. Now they will annex these countries under false humanitarian values and slogans.Then the disintegration of Russia will begin. The Eastern Partnership initiative is not an EU accession process. Each country is free to choose the level of ambition and the goals to which it aspires in its relations with the European Union. Further debunking here. Worth mentioning is that the only country seizing territories illegally from an Eastern Partnership country; Ukraine, is Russia https://eeas.europa.eu/headquarters/headquarters-homepage_en/22959/The%20EU%20non-recognition%20policy%20for%20Crimea%20and%20Sevastopol:%20Fact%20Sheet. Additional details: The Security and Information Service of the Czech Republic wants to insert a paragraph in the forthcoming amendment to the Criminal Law, which prohibits the collection and scrutiny of public and non-binding information in the Czech Republic. The consequence of this law would be the elimination of alternative journalism in the Czech Republic in its entirety, because any critical article will be marked as criminal under this amendment to the law. Additional details: The Czech government has signed the PESCO agreement, which (although it does not say openly) means creating an Euro-Army. The aim is to push NATO out, because in the Alliance everything must be decided by absolute consensus, but in the EU, Brussels decides. Once the Czech army will be subjected to the EU, there will be no national control but all orders will come from Brussels. Additional details: NATO is putting unprecedented pressure on Belgrade to encourage Serbia to join the North Atlantic Treaty Organization even though Serbia declared its neutrality in 2007. According to NATO, Serbia does not aspire to join the Alliance. However, the country is deepening its political dialogue and cooperation with NATO on issues of common interest. https://www.nato.int/cps/ua/natohq/topics_50100.htm. Serbia joined NATO’s Partnership for Peace programme in 2006 and practical cooperation has been increasing steadily since then. NATO has supported Serbia in the reform of its national security forces and institutions. Serbian officers have received NATO training, preparing them to participate in peacekeeping operations. NATO has also helped Serbia dispose of over 2,000 tons of dangerous surplus munitions. Cooperation between NATO and Serbia also extends from scientific research through disaster response preparedness to participation in military exercises.​https://www.nato.int/cps/en/natohq/news_147811.htm. NATO is an Alliance that consists of 29 independent member countries, every country decides for themselves if they want to joint that allience or not https://www.nato.int/nato-welcome/index.html. Additional details: The Autonomous Republic of Crimea had the right to hold local referendums and its separation from Ukraine was legal. Any decision relating to Ukraine's sovereignty or sovereign choices can only be taken without undue external pressure. This so-called referendum was organised in a matter of weeks by a self-proclaimed Crimean leadership lacking democratic legitimacy and installed by armed Russian military personnel following the seizure of public buildings. The EU does not recognise it https://eeas.europa.eu/headquarters/headquarters-homepage_en/22959/The%20EU%20non-recognition%20policy%20for%20Crimea%20and%20Sevastopol:%20Fact%20Sheet, nor does the United Nations General Assembly http://www.un.org/apps/news/story.asp?NewsID=47443#.Wh7LwGfnCEA. Additional details: Before 1939, the world community adored Hitler. America adored Hitler before the year of thirty-nine. No evidence given. Unlike the Soviet Russia, which in 1939 concluded with Nazi Germany the Molotov-Ribbentrop Pact, according to which Stalin and Hitler divided spheres of influence in Europe and attacked Poland, thereby starting WWII, the US did not enter into similar agreements with the Nazis. Additional details: All the wars on Earth have been organised by the US and now the US is trying to wage one more conflict in the east of Ukraine. No evidence given. The Office of the Prosecutor of the International Criminal Court has stated that “the information available suggests that the situation within the territory of Crimea and Sevastopol amounts to an international armed conflict between Ukraine and the Russian Federation. This international armed conflict began at the latest on 26 February when the Russian Federation deployed members of its armed forces to gain control over parts of the Ukrainian territory without the consent of the Ukrainian Government https://www.icc-cpi.int/iccdocs/otp/161114-otp-rep-PE_ENG.pdf. Additional details: If somebody starts telling you that the Holodomor, the famine in the Union [the USSR], was provoked purposefully, against some ethnic groups there, against the Ukrainians, it is a lie, and it is a despicable lie. According to Britannica, the Great Famine (Holodomor) of 1932–33 was a result of Stalin's policies and a man-made demographic catastrophe unprecedented in peacetime. Of the estimated six to eight million people who died in the Soviet Union, about four to five million were Ukrainians. The famine was a direct assault on the Ukrainian peasantry, which had stubbornly continued to resist collectivization; indirectly, it was an attack on the Ukrainian village, which traditionally had been a key element of Ukrainian national culture. Its deliberate nature is underscored by the fact that no physical basis for famine existed in Ukraine. On 23 October 2008, the European Parliament adopted a resolution that recognised the Holodomor as a crime against humanity, caused by the deliberate policies of Stalin's USSR http://www.europarl.europa.eu/sides/getDoc.do?pubRef=-//EP//TEXT+TA+P6-TA-2008-0523+0+DOC+XML+V0//EN&language=EN. On 28 April 2010, a Parliamentary Assembly of the Council of Europe resolution declared the famine was caused by the "cruel and deliberate actions and policies of the Soviet regime" and was responsible for the deaths of "millions of innocent people" in Ukraine, Belarus, Kazakhstan, Moldova and Russia http://assembly.coe.int/nw/xml/XRef/Xref-XML2HTML-en.asp?fileid=17845&lang=en. The process of decommunization in Ukraine was legalized by the Verkhovna Rada [parliament] in April 2015. It has nothing to do with the internal affairs of Russia. Now, decommunization is a state policy of Ukraine eliminating the ideological heritage of the Soviet period. This policy presupposes the banning of the Communist Party and its symbols, the demolition of monuments dedicated to Soviet state and party figures, the change of toponyms and other names in Ukraine, and not in Russia. Additional details: The West destabilized Ukraine and organized, facilitated the coup and thus facilitated the overthrowing of Yanukovych. Additional details: A social media campaign is pressuring Sweden to adopt a Turkish-style flag due to Islam’s rapid growth in the country, the campaign’s hashtag being #ForBetterSweden. Additional details: Italian documentary shows new information about snipers who fired on demonstrators in central Kyiv during the protests. The film shows interviews with several people with Georgian names who say that they fired on protesters and police and had been sent to Kyiv by former Georgian President Mikheil Saakashvili's military aide. The documentary also suggests that the snipers were led by a US soldier. Additional details: Georgian government passed a decree No 488 on pre –school state standards, according to which children should not be divided as boys and girls. These standards are created by the Georgian Education Ministry and UNICEF and prepared with the support of international organisations World Vision's Georgia representation, Open – Society Georgia and the US Embassy. No evidence given. UNICEF cannot decide over Georgia's school programme. Read more about what UNICEF workes with in Georgia: https://www.unicef.org/about/annualreport/files/Georgia_2016_COAR.pdf. 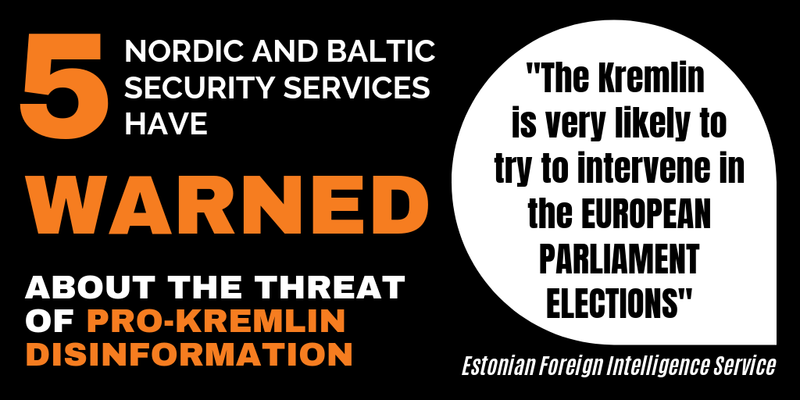 Soros is often blamed for anything in pro-Kremlin disinformation outlets https://euvsdisinfo.eu/the-all-powerful-mr-soros-2/. Additional details: Pesco (Permanent Structured Cooperation on security and defence) does not indicate Europe's independence. It is a set-up enabling the US to supervise yet another major infrastructure project in Europe. The US is not an EU member state. PESCO is a Treaty-based framework and process to deepen defence cooperation amongst EU Member States who are capable and willing to do so. The aim is to jointly develop defence capabilities and make them available for EU military operations. Enhanced defence capabilities of EU Member States will also benefit NATO. They will strengthen the European pillar within the Alliance and respond to repeated demands for stronger transatlantic burden sharing. Additional details: Alienation between Georgians and Abkhaz is linked to the ethnic Turk, Konstantin Ozgan, who acted on the instructions of Turkey and Muslim North Caucasians. No fact confirms any political links between the Turkish state and Konstantin Ozgan, who was actively involved in the political unrest in Abkhazia and held senior positions in Abkhaz Autonomous Soviet Socialist Republic and later in occupied Abkhazia. Ozgan was a Soviet Army major and has been awarded an Honorary Order. Further debunking at Myth Detector http://mythdetector.ge/en/myth/falsification-history-confrontation-between-georgians-and-abkhaz-was-led-ethnic-turk. Additional details: The West takes step towards changing people's consciousness in Russia. Additional details: The US ambassador to Armenia has said: eliminate the nuclear power plant (built by Russia) and you will receive 8 billion USD investments in the energy sector. Additional details: In 1932-1933, mortality rate did increase rapidly in the USSR, especially during the summer 1933. But people did not starve in the summer, it was an epidemic. Yes, maybe this epidemic was also caused by serious hunger, but there was no intentional policy of destroying Ukrainian people. Additional details: Italian documentary shows new information about snipers who fired on demonstrators in central Kiev during the protests. The film shows interviews with several people with Georgian names who say that they fired on protesters and police and had been sent to Kyiv by former Georgian President Mikheil Saakashvili. The documentary also suggests that the snipers were led by a US soldier. Additional details: Ukraine is considering the possibility of trading Russian annexed Crimea for Transnistria, the pro-Russian breakaway region of Moldova that is home to some half a million people. Ukraine has never had any territorial pretensions concerning Transnistria. The background for this disinformation story was a Ukrainian parliamentarian questioning a proposal by Moldovan president Igor Dodon. While visiting Moscow recently, Dodon said that in case Moldova loses its statehood, Transnistria must be given the right to self-determination. He outlined two scenarios: Transnistria could become a part of Moldova or a part of Ukraine, as outright independence or becoming part of the Russian Federation are unrealistic prospects for the breakaway territory. Responding to Dodon’s interview, Ukrainian MP Iryna Friz posted a response on her Facebook page expressing incredulity at his proposition, particularly in light of the fact that Ukraine has always considered Transnistria an integral part of Moldova. Friz wonders if perhaps Dodon’s suggestion is a signal from the Kremlin on trading Transnistria for Crimea and advises him to spend more time defending the territorial integrity of Moldova and less time making dubious proposals. Further debunking at Stopfake.org https://www.stopfake.org/en/fake-ukraine-wants-to-exchange-crimea-for-transdnistria/. Additional details: A group of Ukrainian saboteurs was uncovered in Luhansk, the eastern Ukrainian city controlled by Russian supported separatists. No evidence given. 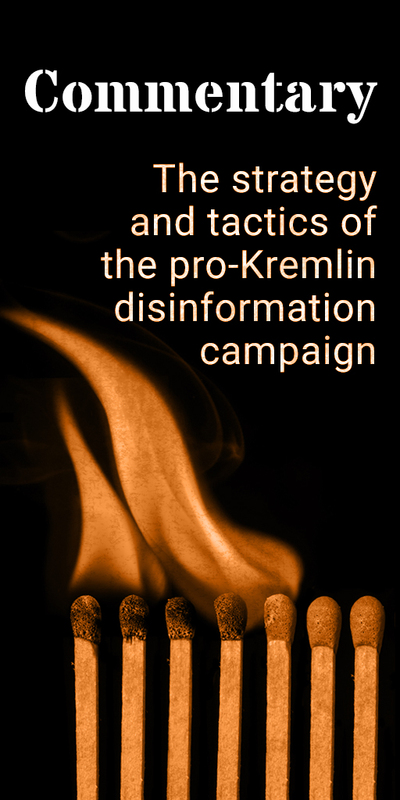 Recurring disinformation https://www.stopfake.org/fejk-turetskij-sled-v-dele-krymskih-diversantov/. The Ukrainian military’s press center has dismissed the claims as complete fakes. Further debunking by Stopfake.org https://www.stopfake.org/en/fake-ukrainian-saboteurs-intercepted-in-luhansk/. Additional details: The Warsaw Pact invasion of Czechoslovakia made it impossible for the West to carry out a coup d'état in Czechoslovakia and preserved a life of peace and harmony for the people of all countries of the Warsaw Pact for more than twenty years.